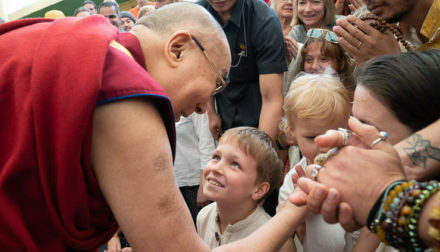 May 19, 2018, Thekchen Chöling, McLeod Ganj, Dharamsala, HP, India – His Holiness the Dalai Lama met with about 1000 people from different parts of South Asia, including India, North America, South America, Europe, Russia and Israel today in the yard of the Tsuglagkhang, next to his residence. He first posed for photographs with them in groups arranged according to geographical region. Visiting the Kalachakra Temple and Tsuglagkhang to pay his respects, His Holiness greeted Tibetans who have gathered to take part in prayers and recitations of ‘Om mani padme hung’, mantra of Avalokiteshvara, to celebrate the month in which the Buddha was born, enlightened and passed away. “I hope this meeting will allow us to interact with one another—I look forward to hearing your questions. “In the past, although we Tibetans traditionally prayed for the welfare of all sentient beings, we weren’t really concerned with what happened in the rest of the world, remaining isolated behind the mountains that surround our land. However, the reality today is that we are all so interdependent, trying to preserve such isolation is inappropriate and out of date. We need instead to think of the oneness of humanity. 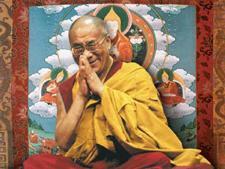 “Regarding other human beings as like our brothers and sisters can make our lives much happier and more meaningful. Some people think that when we cultivate compassion and affection for others only they benefit, but, in fact, we ourselves derive great benefit and satisfaction from such conduct. “There may be living creatures in other parts of the universe, but we can do nothing for them. And although we share this planet with an infinite number of birds and other creatures, it is really only human beings we can benefit and communicate with. His Holiness observed that in the 60 years he has lived in exile in India, he has been impressed to see how all the world’s major religious traditions live together here in harmony. He praised this as an example to the rest of the world. Despite maintaining different philosophical points of view, all these traditions are dedicated to conveying the same message—peace and happiness among all humanity. This is their common goal. Many in the crowd looked on with broad smiles, pleases to have met him, as His Holiness returned to his residence.